The San Jose rock scene was poppin' in the summer of 1966. Former Bay Area "Battle of the Bands" winners Syndicate of Sound drew attention to the city with their hit "Little Girl" while The Chocolate Watch Band waited in the wings, likely anticipating more than the eventual cult status (obtained without benefit of a hit record) that was coming. In between these notorious garage grandstanders came a five man outfit that rocked harder, hit bigger and burned out more quickly than either of their leading hometown competitors. Count V also had more of a proclivity towards gimmickry than their peerbands: they often appeared wearing capes (one "official" photo shows them in front of what could, perhaps, be a haunted house), striking Vampiresque poses a la Dracula..."The Count"...get it? Hey, whatever it takes to get noticed! This monsters' ball first got rolling in 1964 when two friends from Pioneer High decided to form an instrumental surf band...a little late for the genre's peak. Bassist Roy Chaney headed the group with his friend, guitarist John Michalski, who preferred to be called "Mouse"...but he was not the already-semi-famous Mouse (Fresno-born, San Francisco-based Stanley Miller) of monster T-shirt fame, nor was he the Mouse (Ronnie Weiss) of Mouse and the Traps, a band formed the same year in Tyler, Texas. So that settles that...potential rodentious confusion avoided. Michalski had already played with a couple of surf- and/or drag-themed local groups; with Chaney and drummer Skip Cordell they formed The Citations, later adding lead singer and harmonica player Kenn Ellner and keyboardist Phil Evans, changing the group's name to The Squires in a misguided attempt to give them some semblance of British Invasionness. The British thing didn't gel right away, even after Ellner's neighbor, rhythm guitarist John Byrne, originally from Dublin, Ireland, joined as a replacement for Evans. John preferred to be called "Sean," but it's not clear if he was a fan of Scottish superstar Sean Connery of James Bond fame or just a guy who had trouble pronouncing his own name. Cordell also quit; his spot was filled by Craig Atkinson, who went by the nickname "Butch" (not to be confused with Butch Cassidy or jazz drummer Butch Ballard or...I think I'm getting carried away here). 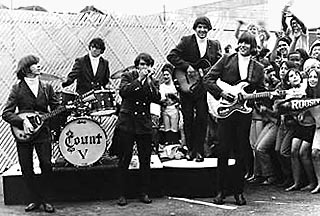 One next-to-last name change: Count V had given them an excuse to wear the horror movie gear, then later they just went with Count Five, though the Count V logo on Butch's bass drum remained for quite some time. The music of their favorite British artists stuck in their heads, despite the distinctly American garage band sound that had begun taking hold by 1965. The C5's heroes were The Yardbirds, Who, Animals, Stones et al, and it was these groups they emulated. Failed auditions for several record labels suggested their abilites were either subpar or record company A&R men just didn't get it (I'm leaning towards the second possibility). 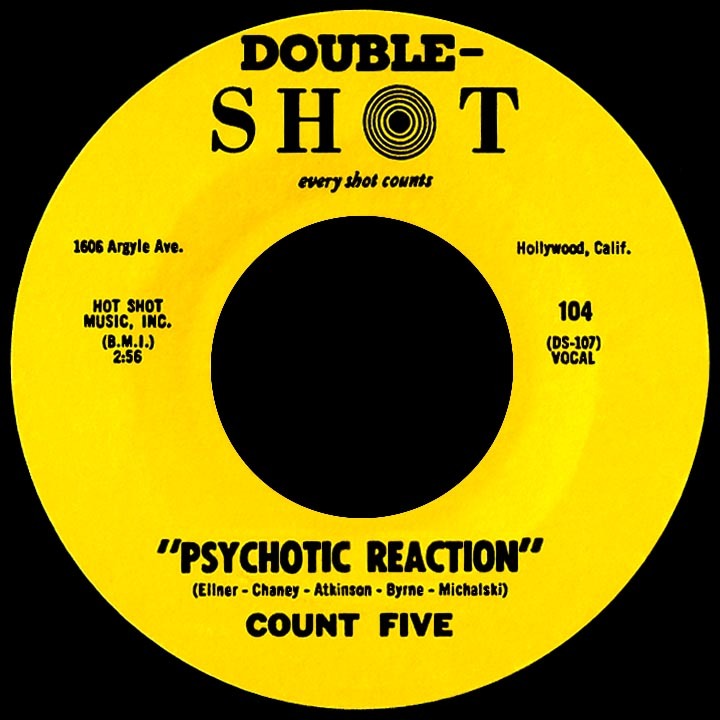 The song's curious title, "Psychotic Reaction," was proposed to the others by Sean Byrne, who claimed a friend from school had come up with it. All five group members contributed to its creation, though the resultant demo recording went through a process of tweaking as they performed it at local events, constantly adjusting the lyrics and tempo. Brian Lord, a local disc jockey, had connections at L.A.'s Double-Shot Records; Irwin Zucker, the "Promotion in Motion" man for the label, saw potential there and signed them up. A reverberating, distant-sounding harmonica, buzzing electric guitar and unconventional tempo changes make the band's "Psychotic" debut quite unique, a blues-infused Brit rock mock-up with a blast of highway 101 garage energy and strange, sometimes garbled, lyrics; the line that stands out is 'I can't get your love, I can't get satisfaction...I owe a little girl a psychotic reaction,' giving a nod to the U.K. influence (The Rolling Stones) and much-closer-to home current hitmakers (Syndicate of Sound). 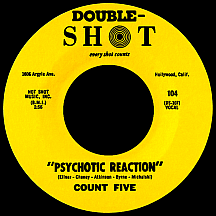 The single started getting airplay locally that summer, just as SOS's "Little Girl" was peaking in the top ten; in September '66, "Psychotic Reaction" broke nationally, caught fire immediately and hit the top ten in early October. The follow-up, "Peace of Mind," veered further into psychedelia, and why not? Most garage rockers were on a mission to blow minds by that time. After some brief initial interest, airplay on a smattering of stations and a November appearance on American Bandstand lip-syncing to both singles, the record stiffed (trippy flip side "The Morning After" might have had a better shot at making it). The Five's first and only album (titled after the hit single) posted unspectacular sales into early 1967...it deserved better. Lead singer Ellner announced all five would be returning to college to pursue degrees while continuing to make records (Michalski later admitted avoiding the draft, and the possibility of being sent to Vietnam, was the main reason for the decision). Another group-composed track, "Teeny Bopper, Teeny Bopper" (tuffer than the title suggests), was coupled on the third single with a straightforwardly bland remake of The Impressions' 1964 hit "You Must Believe Me." Later efforts ("Contrast," "Declaration of Independence") were often very good as the band experimented with unusual sounds set to streetwise lyrics; though they occasionally covered other artists' songs, Count Five's original material was their best. After the sixth single, "Mailman," in 1969, Double-Shot dropped the act and they all went their separate ways...until the summer of 1987, when they reunited for a one-time-only concert in San Jose, the psychotic Silicon Valley location of the original reaction.